As the first Europeans arrived in the New World, they walked across beaches, waded bogs, roamed thick forests and transversed hardy meadows filled with unfamiliar plants. These new wildflowers, ferns, vines, trees and shrubs had been developed by nature to best suit America’s climates and soils. Although many foreign plants have been successfully introduced in the roughly 500 years since America’s colonization, no exotic imports satisfy wildlife’s needs or express the beauty unique to America as well as native plants. 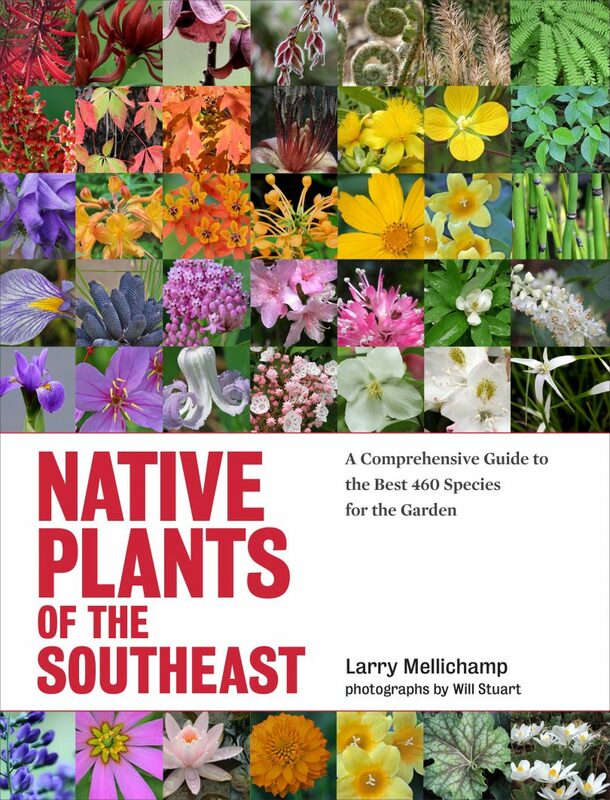 If you are contemplating adding more variety to your garden this autumn, Native Plants of the Southeast (Timber Press, 2014) by Larry Mellichamp is an excellent introduction to this type of vegetation. The author is as native to the Southeast as the plants he recommends. Born in North Carolina, Larry Mellichamp has been a professor of botany at the University of North Carolina in Charlotte for over 30 years and is director of that university’s botanical garden. His educational efforts on native plants were recognized in 2009 when he received an award from the North Carolina Native Plant Society. The book opens with a well-written introductory chapter that explains issues that affect native plants‘ growth in home landscapes. Surprisingly, Mellichamp refutes a myth that these native plants are more easily grown than “the popular landscape exotics … selected for the tough conditions of the home site.” He explains that the environmental conditions of a native plant’s light, moisture and soils can only be modified to a limited extent in replanting. To aid in recognizing the needs of native plants, he carefully describes the various types of habitats present in the Southeast that stretch from Virginia to northern Florida and across the South to the Mississippi River. The 460 plants he recommends as the best for home landscapes are divided into nine types that vary from ferns to trees. Each section is introduced by a discussion equivalent to an interesting botany lecture on the history, requirements and uses of that type of plant. A lovely photograph and detailed information on their cultivation accompany each included plant. Mellichamp also rates each plant’s ornamental merit with one to four stars. To those gardeners who need encouragement to add a few Southeastern native plants to their landscape, take an autumn walk down a Triangle greenway. Wander paths surrounded by the red, orange and gold leaves of maples. Bask in the yellow warmth of swaying goldenrod and towering swamp sunflowers. Admire the bluish-purple of climbing asters. Be inspired to plant a bit of America’s beauty.